The Free State municipality is spending more than R12.1 million in an attempt to do away with the bucket toilet system. Mafube Local Municipality executive mayor, Jabulane Sigasa, in Villiers, Qalabotjha location, said while the municipality had already eradicated 70 percent of all bucket toilets in the location, a decision was made in the last financial year for the total eradication of the bucket system by this year. “Currently, bucket eradication is still not complete in extension seven and eight settlements in Qalabotjha, where a backlog of 1 261 families were still using bucket toilets,” said Sigasa. The municipality’s bucket eradication project started last year with Fezile Dabi district municipality and Bloem Water allocated funding of 363 and 1056 households eradication respectively. During Sigasa’s visit to the project this week, work was in progress with the connection of toilets in the areas. Sigasa said he is happy with the progress made on the project and that the residents of Qalabotjha will benefit. “It is a step forward in ensuring that people receive services that will significantly change their lives for the better. However, it is also to ensure that the municipality is closely in line with a call made by President Jacob Zuma in 2007 that municipalities around the country should ensure the eradication of bucket system toilet,” said Sigasa. A 55 year old mother living in a shack, Boniwe Shamo, applauded the municipality for the job well done by doing away with the bucket system. “We have been living in these conditions for years but we are happy now that we will be able to use flashing toilets,” said Shamo. 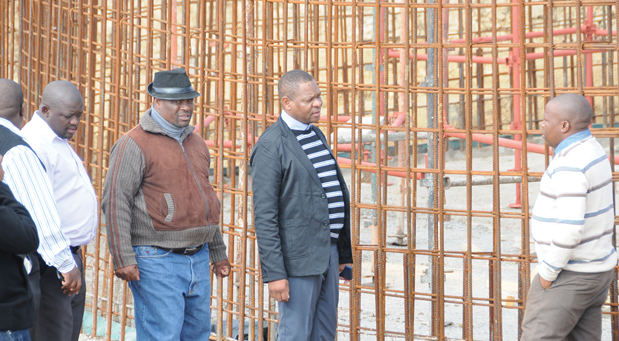 Meanwhile, a massive construction of R35.8 million extension of waste water treatment works outside the location is underway with 38 percent work completed. Sigasa said the project is expected to be completed in November this year. “The upgrading will see the plant handling the growing population in the area. It would be difficult for the plant to carry the whole area of Villiers because of its small capacity. That will also result in some blockages in some parts of the area,” emphasised Sigasa. The new multi-year project of waste water treatment works which started in 2012 received funding from the Municipal Infrastructure Grant (MIG).